Well, after that radio thread, Jeti really piqued my interest. Not so much for my buddy who was getting back into jets. I still love my 12x MV, but all the goodies available on the DS-16 and now there is a DS-24 coming out! What's the story Jeti? When is it coming out? 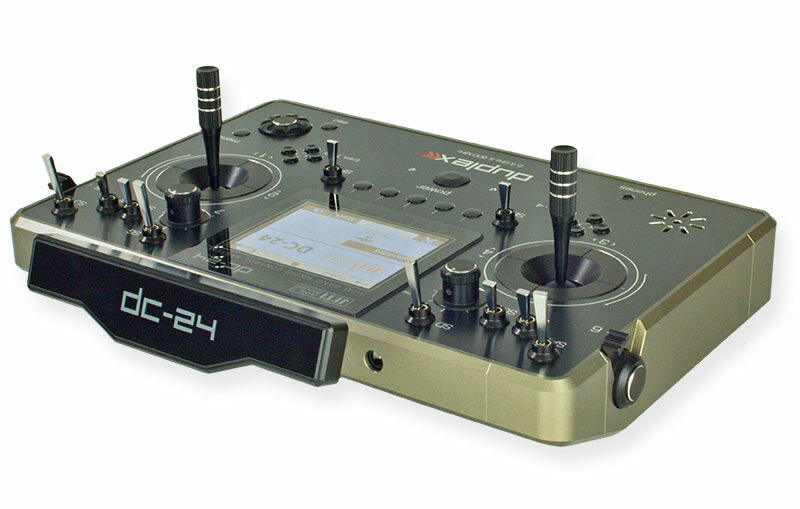 The DC-24 (tray version) was recently received by Esprit tech and will be going for FCC certification soon. http://www.rcuniverse.com/forum/rc-j...-4-ghz-94.html thread # 2344. The DS24 (hand held) version is expected by mid 2016. Just last week a new firmware was released for the DC/DS 16 (firmware 4.0) which increased the capabilities of the DC/DS 16 to 24 channels. In in my opinion it's the best radio on the current market. Not quite DS-24 yet, but DC-24 is very very close. I'd love to be in a position to handle a DS-24 & a DC-24 side by side. Used to the hand held transmitters but have been using trays for years now. Might as well use a tray type transmitter. I'll keep my 12x until then! I took couple of pictures of the screen, this thing is incredible bright. No problem reading it outside on the sun. Wow. Will it pick up my clothes from the cleaners??!!! That's my next radio but the DS version. I will keep my DX18 G2 for just the BnF stuff. just subscribe to the jeti thread on here. you will get good info..
"Just last week a new firmware was released for the DC/DS 16 (firmware 4.0) which increased the capabilities of the DC/DS 16 to 24 channels." I have been reading all the ver 4 upgrade information and I am missing where this is stated. Not calling you out, but if I can see this on the vendor site there is no need to buy a DS-24. The green DS-16 upgraded with ver 4 is the ticket for me. Can anyone find this on the vendor web site? Where did I miss it? Nope, it's a color screen but, not a touch screen. Pro's and con's to each. Personally, I absolutely hate my Mini Ipad's touch screen. So many times have I "touched" the wrong part and gone somewhere I didn't want to go. Can't imagine what a PITA that would be on my Tx. I prefer the Jeti scroll wheel. As a Futaba user I posted earlier in this thread in favor of Jeti over Futaba, stating that if I didn't already have an investment in an 18mz (plus a fleet of Futaba receivers) and was starting from scratch I'd go Jeti. In light of the above posts about touch screens though, its only fair to mention that the touch screen on the 18mz is very handy. I love it and don't find selecting the proper function to be a problem at all. I find very little similarity between the use of an iPad mini (which I also own) and the programming of a transmitter, and based upon my personal experience I'd say any comparison between the two, unfavorable or otherwise, is quite a stretch. We had this discussion back and forward for long time. When we asked pilots over 80% prefer NOT to have touch screen over large display on the bottom of the radio. In real life tiny icons, sunlight, dusty fields, glow/gas fuel with oil and sweaty fingers with emergency situation do not mix well. With voices, gyros and addition of new voice interface, all of us are using screen less and less of the time. The touch screen on my 18MZ isn't as useful while flying. However, it's extremely useful for setting up my planes. Navigating a dial/physical buttons is a PITA versus tapping on the UI affordance on-screen. Asking consumers (pilots) what they want will only give you biased info based on previous transmitter touch screens they've used in the past. Aside from the 18MZ, most of those touch screen user interfaces are on antiquated transmitters. Build a prototype of a touch screen UI and a non-touch screen UI and I'm 100% sure most will prefer the touch screen. The computing industry has figured this out a long time ago and the ones who didn't are no longer as relevant. I wouldn't expect a "Team Jeti" rep to say anything different. ;). To be clear, I'm not saying the dial UI on the Jeti is bad. I haven't used it, so I can't comment. My response was to Jeti USA dismissing touch screens in general. I plan to get a DS-24 when it comes out to try for myself. I'm a fan of what Jeti is doing. Exactly. While Futaba has clearly missed the telemetry boat - an aspect at which Jeti excels - Futaba's touch screens are excellent and there's no reason at all to say otherwise. I'm guessing that any "survey" in which 80% of users supposedly said they didn't want one was severely flawed in terms of population analysis. The Jeti Rep statement above "... In real life tiny icons, sunlight, dusty fields, glow/gas fuel with oil and sweaty fingers with emergency situation do not mix well..." does NOT itself, ironically, reflect real life for this 18mz user. One might as well just say "If we didn't include it then you shouldn't want it", which sounds arrogant and/or like pathetic excuse making, and does not represent the Jeti brand any better than when Futaba defenders insist that telemetry is useless. I looked at Jeti for several years. I mean I looked hard! My bud has the DC16 tray version which I used for a bit. It's ok.. the ergonomics for the DS 16 are just OK.. Hard Corners bulky appearance of a Dated design. The Software though is very good. I have no doubt about that. It will do just about anything you want. For me, a long time 14 MZ user, The 18 Mzh was the logical choice. I do like the touch screen. Always have in fact. The Telemetry for the 18MZ is plenty sufficient for what I need. I wouldn't expect a "Team Jeti" rep to anything different. ;). To be clear, I'm not saying the dial UI on the Jeti is bad. I haven't used it, so I can't comment. My response was to Jeti USA dismissing touch screens in general. I plan to get a DS-24 when it comes out to try for myself. I'm a fan of what Jeti is doing. Is Jeti not capable of accepting constructive criticism of any kind, or fathom that not everybody loves their radio for personal reasons?